Apart from testing mechanical rules based on indicator readings, backtester can also be used to generate all statistics based on a list of pre-defined trades, list of our real trades from the past or a list of trades generated from another software. We can read and backtest such input with the formula presented below. It is important to remember that this particular code can work with input files of identical format (columns in identical order, signals specified with exact Buy / Sell words, position sizes specified as shares). Changing the input format would also require to update the formula to match the input. Path to the file is specified in the very first line (note that double backslashes need to be used). 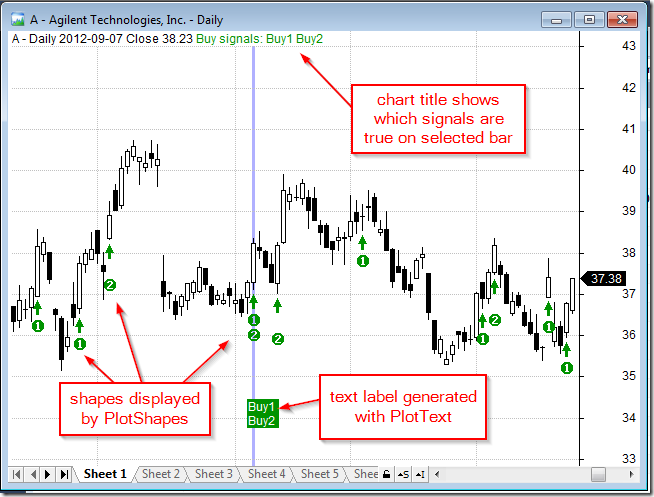 The formula reads the file line by line, then on a bar with matching date/time it generates a new Buy or Sell signal that is then combined with existing signals (coming from other bars). From time to time people send us their formulas asking what happens in their own code. Or they do not know why given trade is taken or not. These questions are usually caused by the fact that people lack the insight what is happening inside and what values values their variables hold. The first general-purpose debugging technique is using Exploration. You need to add several AddColumn statements and run your code as Exploration, so you can actually see the values of all variables. This will reveal whenever you really have values that you expect and would make it easier for you to understand what is happening inside your code. and it will show you if you are getting expected values in Buy array. You can use the same technique to track the content of any variable. Add as many columns as you want. You would be surprised how much insight into your own code you will get. If you run above code you will clearly see how ValueWhen picks the value when condition is true and “holds” it for all other bars (when condition is false). Once you get this level of insight into your code you will be better equipped to fix any errors. Exploration is number one choice in getting detailed view on what is happening inside your code. AmiBroker 5.84 (released today) offers users an easy way to create their own code snippets. Code snippet is a small piece of re-usable AFL code. AmiBroker comes with lots of pre-defined snippets. You can learn more about built-in snippets here. But now you can add your own! And it is fairly easy using new Code Snippet window. Code Snippets window is available in new AFL editor (in floating frame mode). It can be shown/hidden using Window menu. Now you need to enter the Name of the snippet, the Description and Category. Category can be selected from already existing items (using drop down box), or new category name can be typed in the category field. Key trigger field is optional and contains snippet auto-complete trigger (to be implemented later). Once you enter all fields and press OK, your new snippet will appear in the list. From then on you can use your own snippet the same way as existing snippets. Perhaps most convenient method is using drag-drop from the list to AFL editor. As you may have noticed user-defined snippets are marked with red color box in the Code Snippets list. Only user-defined snippets can be overwritten and/or deleted. To overwrite existing user-defined snippet, simply follow the steps above and give existing name. 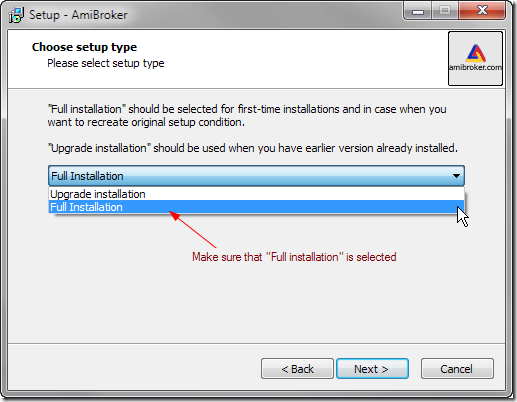 AmiBroker will ask then if you want to overwrite existing snippet. To delete a snippet, select the snippet you want to delete from the list and press Delete (X) button in the Code Snippet window. When we perform historical tests on databases that contain delisted symbols – we may encounter a situation, where there are open positions in those tickers remaining till the very end of the backtest, distorting the results (as these open positions will reduce remaining maximum open positions limit for the other symbols). What is important, this approach would work also, when Pad and Align to reference symbol feature is used in Analysis window settings. From time to time we are asked how to import large text (ASCII) files quickly. Normally speed is non-issue for ASCII import as it is blazing fast. That kind of question typically comes from person who wants to import hundreds of megabytes of data. ASCII importer is optimized for adding new data to the existing database, so the most efficient operation is adding current quote (the newest one). In SQL query talk it would be “ORDER BY Symbol ASC, Date ASC”. Doing so ensures that no sorting is required during import and symbol shuffling is reduced to minimum, so in-memory cache is used most efficiently. If your file is not ordered or ordered in reverse then it takes long to import because AB must shuffle data. In worst case scenario (newest records first), every data insert involves sorting which makes it a killer. The difference can be hours vs seconds on properly sorted file. If you can not change the active symbol for the chart, chances are that you have accidentally clicked “Symbol Lock” icon (a small padlock) located near the scroll bar. 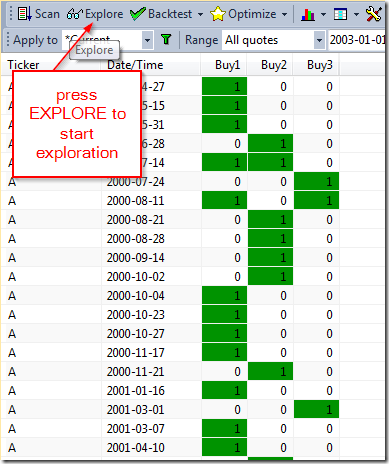 When it is activated (yellow) then AmiBroker will prevent any symbol changes for active chart window. To toggle lock simply press the padlock icon. When designing a trading system we often need to quickly identify which of the rules used in the code triggered the particular Buy or Sell signal. Here are some techniques that may be useful in such identification. To determine which of those three rules generates the entry signal, we can either visualize signals in the chart or use Exploration feature of the Analysis window. use PlotText to add pre-defined text labels. The chart below shows how to use signal visualization technique implemented in the formula. 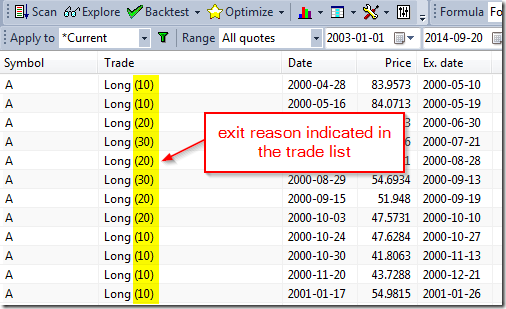 With regard to exit signals they can be visualized in a similar way as shown above, but there is also an additional functionality in the backtester, which allows to indicate the exit condition directly in the trade list. This can be done by assigning values higher than 1 (but not more than 127) to Sell variable. The above expression will result in assigning value of 10 to Sell variable for the bars where Sell1 is true, 20 for the bars where Sell2 is true and 30 for the bars where both conditions are true. Note also that you must not assign value greater than 127 to Sell or Cover variable. If you assign bigger value it will be truncated. When running AmiBroker on high-DPI displays like Retina screens, 4K screens or small tablets with hi-res displays the toolbar icons may become so small that they are difficult to use. select Large Icons check box as shown in the picture below. Every now and then a user contacts support saying that some functionality (like OLE interface) stopped working and after some e-mail exchange it turns out that the culprit was a “Registry Cleaner” program that was run and deleted some vital registry entries. These programs are written pretty much often by amateurs and they often blindly delete registry entries that they assume are “no longer used”. First off, there is no freaking way a 3rd party program can ever determine when a registry key is “unused”. It was evidently put there for a reason and could have been accessed hundreds or thousands of times. “Registry cleaners” usually make assumptions that are simply not valid. For example, they may check for the presence of file referenced by the registry key, but they silently ignore the fact that the file may be on removable media (such as USB disk) and that Windows may change drive letters when new drive is inserted. In such cases “registry cleaner” would delete perfectly valid registry key causing problems with the software that was using this key. AmiBroker can live with most of its registry entries deleted (you would lose all your UI customizations though) with one exception: OLE. AmiBroker exposes OLE automation server (Broker.Application) and if 3rd party “registry cleaner” wipes its registry keys, the OLE would stop working. This affects also auto-import feature in AmiQuote as it relies on AmiBroker’s OLE automation server. So bottom line is: To avoid problems DO NOT USE “registry cleaners”. Now, what to do if you already run registry cleaner and have problems? That should cure the problem with OLE within seconds. Good luck!